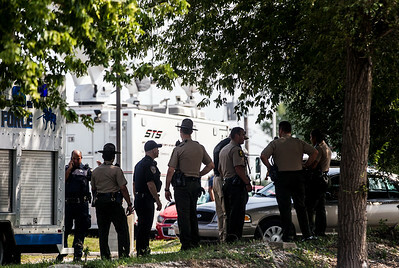 Sarah Nader- snader@shawmedia.com Police officers gather during a manhunt for three suspects in the fatal shooting of Fox Lake police officer Tuesday, September 1, 2015. 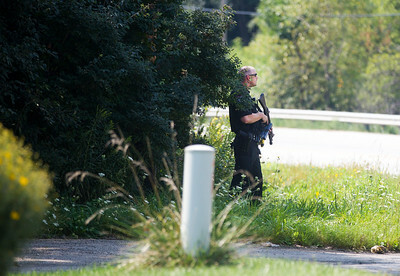 Sarah Nader- snader@shawmedia.com A police officer patrols Frontage Road during a manhunt for three people suspected in the killing of a police officer Tuesday, September 1, 2015. 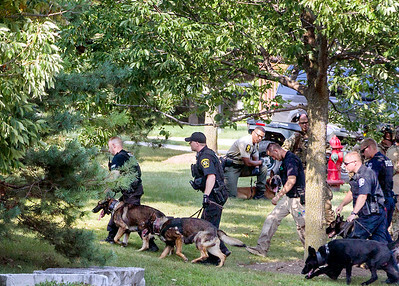 Sarah Nader- snader@shawmedia.com Law enforcement gathers during a manhunt for three suspects in the fatal shooting of a Fox Lake police officer Tuesday, September 1, 2015. 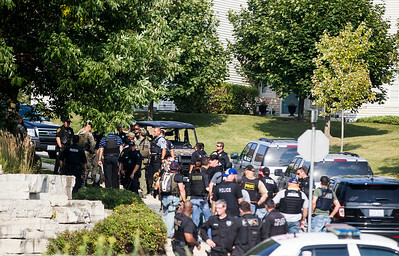 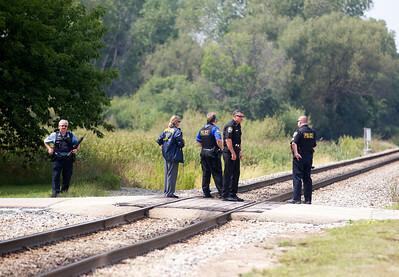 Sarah Nader- snader@shawmedia.com Law enforcement gather during a manhunt for three suspects in the fatal shooting of a Fox Lake police officer Tuesday, September 1, 2015. 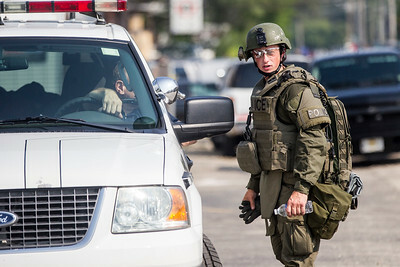 Sarah Nader- snader@shawmedia.com A police officer patrols the area during a manhunt for three suspects in the fatal shooting of a Fox Lake police officer Tuesday, September 1, 2015. 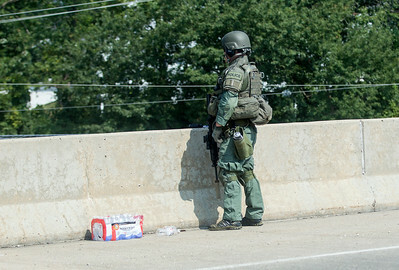 Sarah Nader- snader@shawmedia.com A law enforcement officer patrols the Route 59 bridge in Fox Lake as he looks for suspects in the fatal shooting of an officer on Tuesday, September 1, 2015. 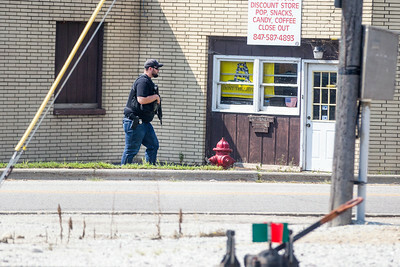 Sarah Nader- snader@shawmedia.com Law enforcement patrols the area during a manhunt for three suspects in the fatal shooting of a Fox Lake police officer Tuesday, September 1, 2015. 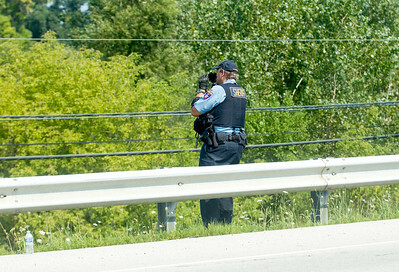 Sarah Nader- snader@shawmedia.com A police officer patrols Route 59 in Fox Lake during a manhunt for three suspects in the fatal shooting of a Fox Lake police officer Tuesday, September 1, 2015. 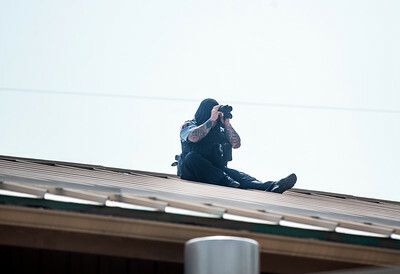 Sarah Nader- snader@shawmedia.com A police officer scans a swampy area from the roof of Epic Fitness in Fox Lake during a manhunt for three suspects in the fatal shooting of a Fox Lake police officer Tuesday, September 1, 2015. 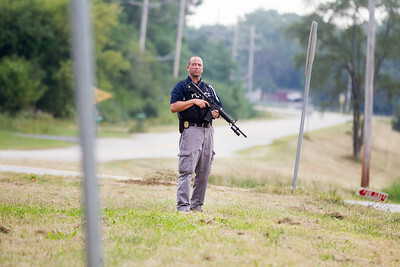 Sarah Nader- snader@shawmedia.com A police officer patrols Route 59 in Fox Lake during a manhunt for three people suspected in the killing of a police officer Tuesday, September 1, 2015. 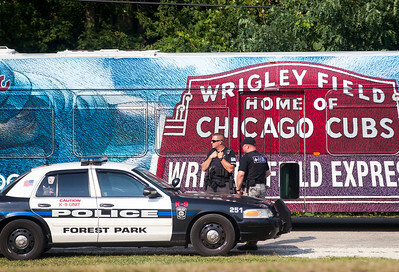 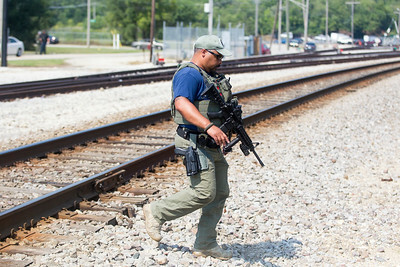 Sarah Nader- snader@shawmedia.com Police officers patrol an area near the Ingleside Metra stop during a manhunt for three suspects in the fatal shooting of a Fox Lake police officer Tuesday, September 1, 2015. 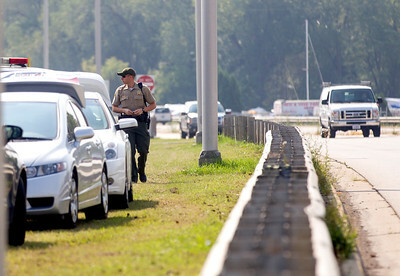 Sarah Nader- snader@shawmedia.com Law enforcement ride down Route 59 in Fox Lake during a manhunt for three people suspected in the killing of a police officer Tuesday, September 1, 2015. 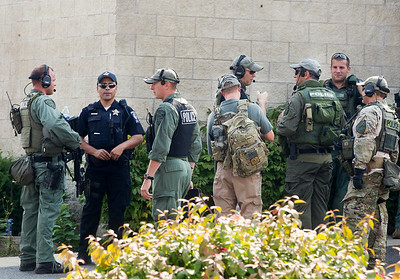 Sarah Nader- snader@shawmedia.com Police officers gather during a manhunt for three people suspected in the killing of a police officer Tuesday, September 1, 2015. 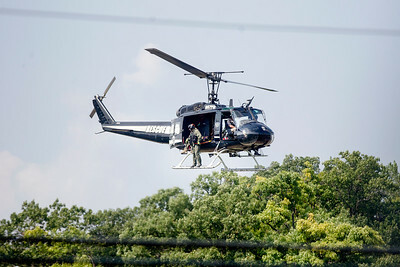 Sarah Nader- snader@shawmedia.com A police helicopter patrols a swampy area off Route 59 in Fox Lake during a manhunt for three people suspected in the killing of a police officer Tuesday, September 1, 2015. 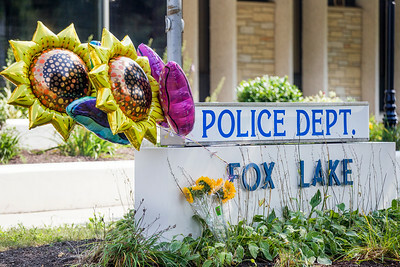 Sarah Nader- snader@shawmedia.com Balloons and flowers were left at the Fox Lake Police Department during a manhunt for three people suspected in the killing of a Fox Lake police officer Tuesday, September 1, 2015. 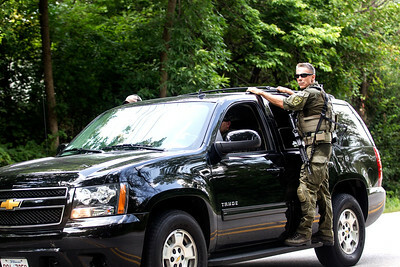 Sarah Nader- snader@shawmedia.com Law enforcement patrol an area off Route 59 in Fox Lake during a manhunt for three people suspected in the killing of a police officer Tuesday, September 1, 2015. 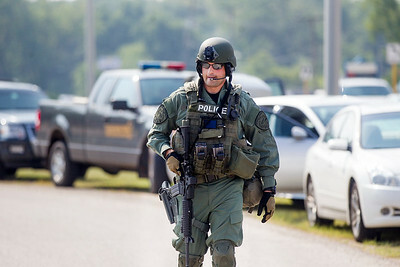 Sarah Nader- snader@shawmedia.com Law enforcement patrol an area off Frontage Road and Fox Ridge Drive in Fox Lake during a manhunt for three people suspected in the killing of a police officer Tuesday, September 1, 2015. 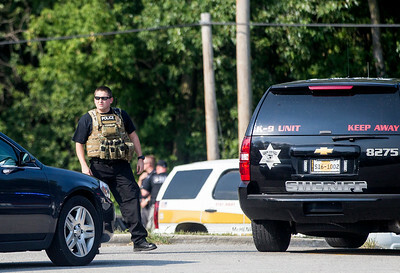 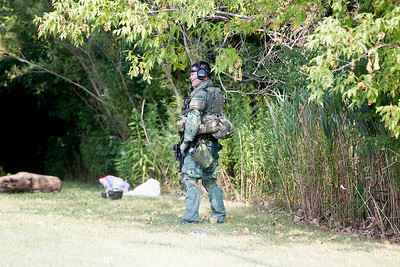 Sarah Nader- snader@shawmedia.com Law enforcement sweep an area off Frontage Road and Fox Ridge Drive in Fox Lake during a manhunt for three people suspected in the killing of a police officer Tuesday, September 1, 2015. 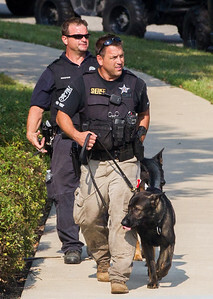 Sarah Nader- snader@shawmedia.com Law enforcement and K9 units sweep an area off Frontage Road and Fox Ridge Drive in Fox Lake during a manhunt for three people suspected in the killing of a police officer Tuesday, September 1, 2015. 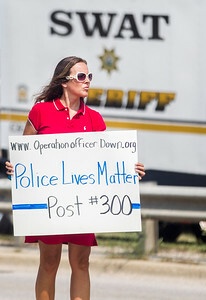 Sarah Nader- snader@shawmedia.com Gina Maria of Fox Lake holds up a sign near a police staging area in Fox Lake as the search continues for three suspects in the fatal shooting of a Fox Lake office Tuesday, September 1, 2015.“I’m here supporting law enforcement officers letting people know that police lives matter,” she said. 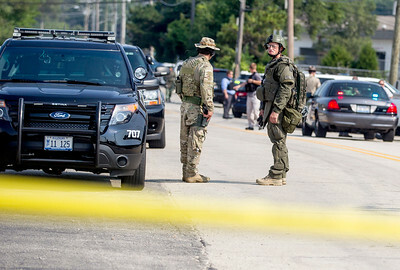 Police officers gather during a manhunt for three suspects in the fatal shooting of Fox Lake police officer Tuesday, September 1, 2015.